Returning to the war room after a 10-year hiatus, Oakland Raiders head coach Jon Gruden took a boom-or-bust approach to the 2018 NFL Draft, placing significant weight on the shoulders of both his positional coaches and medical staff to turn potential into on-field results in a hurry. Starting with his first pick of draft weekend, Gruden selected UCLA’s Kolton Miller, our seventh-ranked offensive tackle in the class, with the 15th overall pick of the draft. While his 6-foot-9, 309-pound frame and high-end athleticism stand out as key positives, Miller earned a third-round grade from us due to technical deficiencies in his game and a lack of play strength. However, as can be said of almost all of Gruden’s draft picks, Miller has the potential to be a star blindside protector in this league if he can button up his imperfections with NFL coaching. Gruden continued to seek out upside on Day 2, adding small-school standouts PJ Hall and Brandon Parker with picks Nos. 57 and 65, respectively. Hall, a star interior defender at Sam Houston State, is built like an ox and has the strength to back his 6-foot-1, 310-pound frame. He racked up 42 sacks and a record-breaking 86.5 tackles for loss, and he continued a similar reign of terror against FBS competition in the 2018 East-West Shrine Game. He will need time to adjust his play to the speed and talent of NFL competition, but his potential is significant. Like Miller, Parker brings great size and athleticism to the table at 6-foot-8, 305 pounds. But, the former North Carolina A&T offensive tackle also shares Miller’s faults in that his technique is far from polished. Parker earned sub-75.0 overall grades in three of his five starts against FBS competition in his career, and he allowed six total pressures across just 36 pass-blocking snaps in the 2018 Reese’s Senior Bowl. 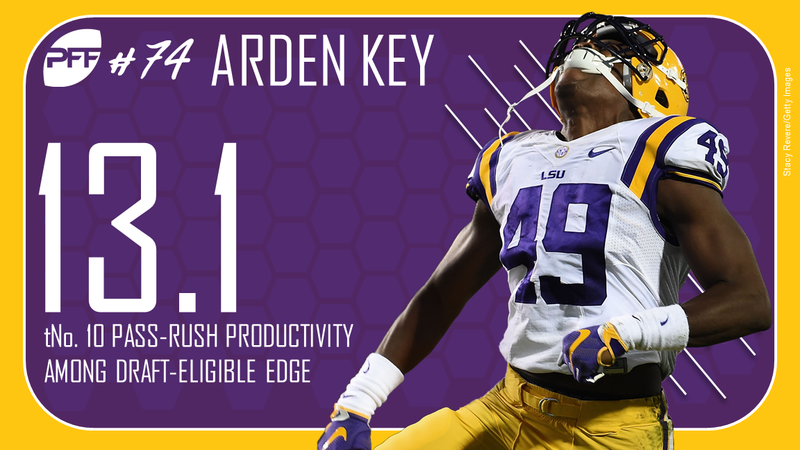 Gruden & Co. capped off Day 2 with a bit of a bang, selecting former LSU edge Arden Key. While off-field concerns and an underwhelming showing in 2017 pushed him down draft boards, Key can far out-play his draft status if he can return to and maintain his 2016 form. He recorded 54 total pressures en route to an 88.0 overall grade as sophomore in 2016 before falling off quite a bit the following year. 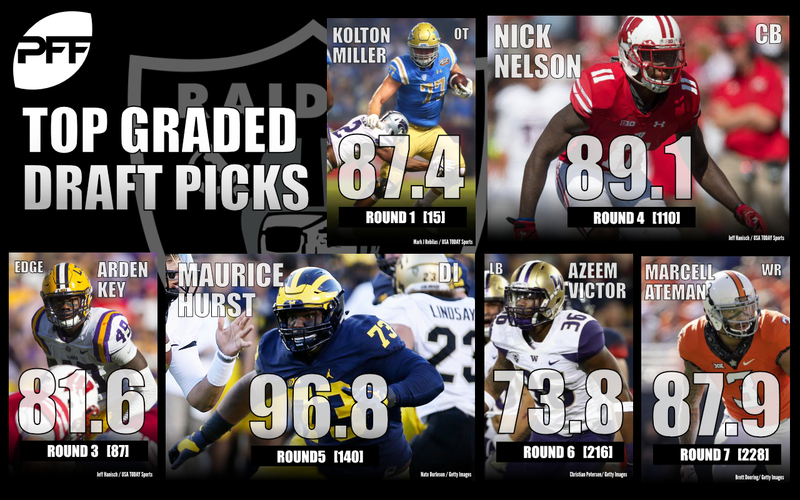 Day 3 marked a turnaround for the Raiders’ draft haul, as Gruden nabbed two quality players in former Wisconsin cornerback Nick Nelson and Michigan’s Maurice Hurst at a discounted rate due to injury concerns. Nelson is coming off a spectacular year with the Badgers, as evidenced by his 89.1 overall grade, but injuring his meniscus in a pre-draft workout caused him to freefall down draft boards. Similarly, Hurst had one of the most productive careers we’ve ever seen from an interior defender at the collegiate level, but his well-documented heart condition slashed his draft stock. If the two can stay healthy and mirror their collegiate production, Oakland could come away with two of the draft’s biggest steals. Oakland rounded out their draft with two intriguing depth players in former Washington linebacker Azeem Victor and Oklahoma State wide receiver Marcell Ateman in addition to a new starting punter in Florida’s Johnny Townsend. A proven directional punter with pinpoint accuracy, Townsend earned the third-highest overall grade among draft-eligible punters in 2017.